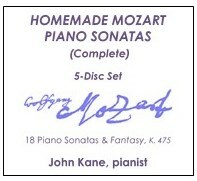 Homemade Mozart Piano Sonatas (Complete) was recorded January - March, 2015, and includes all 18 Piano Sonatas and the Fantasy, K. 475. This 5-CD set is available for $85 + S/H or individual tracks listed below can be purchased as MP3 downloads. Please click on track number below to hear a brief excerpt.